Mumbai, December, 2012: Getting rid of those dark circles is not an easy task. The major reason behind this dark circles is that stagnation of melanin in that lower layer of your eyes which is also the reason for dull skin. 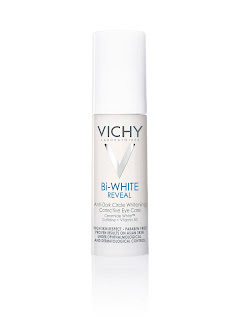 VICHY Laboratoriespresents the revolutionary, BI-WHITE REVEALAnti-Dark Circle Whitening Corrective Eye Care with a novel mechanism for whitening in the in the skin cream world. Contains Ceramide WhiteTM in alliance with Caffeine and Vitamin B3 providing a complete power packed solution for dark-circles. § Ceramide White TM which controls the cellular signal at the origin of melanin production. § Caffeine which helps to relieve congestion, stimulate the inner micro-circulation and evacuate stagnating haemic pigments. § Vitamin B3 which helps to inhibit vascular dilatation and increase the micro-circulation flow. These core ingredients works on generation of cells which control the melanin production and also treat and clean the existing melanin and provides that glowing skin to match your beautiful eyes. The results,reduction in pigmented dark circles are visibly reduced in size, color and intensity*, are evident in just 4weeks of the use of products. The eye contour looks visibly lighter giving your face that radiant and even skin tone. Dullness is noticeably reduced making eyes look brighter and more beautiful!